what does one do when one is laid up in bed, without necessarily lying down ? And this lovely pattern, shared on the same day, caught my eye. I've been meaning to tat one of her designs for a while now. I liked two aspects - the 16 central outward-facing rings, and the thrown rings on the last round. Perfect! After a bit of dallying over choice of colours, I settled on traditional pink flowers and brown bark of tree. Tatted in size 40 threads, it measures 4½ inches across. Anchor Mercer Art. 4054 : pink - 052 ; brown 00352. I needed less than 2 full bobbins of pink and 1 full bobbin of brown. Techniques : 2 shuttles , thrown rings, mock ring with thrown rings. I cut and joined for each round. Started the last round with brown thrown ring instead of the sakuras. 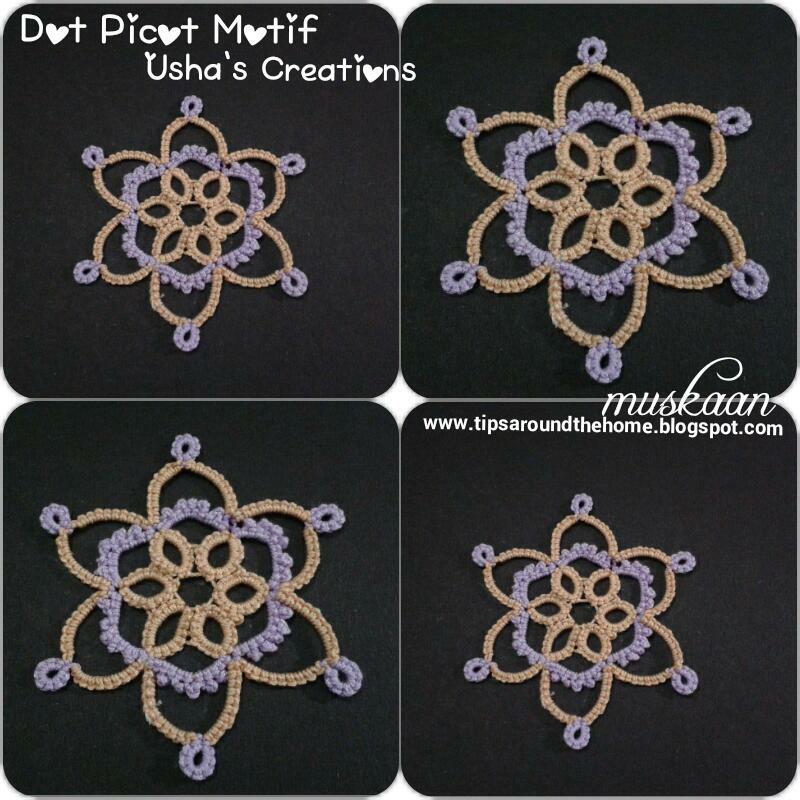 Click here for the free pattern, and also to view more of her exquisite tatting. 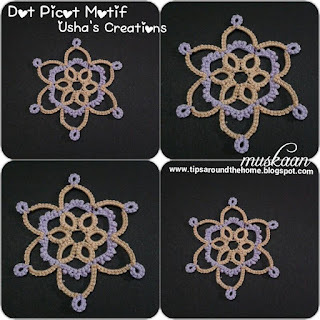 I thoroughly enjoyed tatting this ! And on a totally different note, now that I can do beads, who knows when I might need a large shuttle to load beads ?! Couldn’t find them on Amazon, so Pinterest to my rescue ! Last year, Tamara had requested testers for her prototype cardboard shuttles on Craftree and this is what I rustled up within a few minutes, using doubled-up cardstock. Crudely made, but worked well enough to give her feedback and suggestions. I was too ashamed to post, coz Eliz had soon made a perfect set! This time I cut out the sides from an empty L’Oreal shampoo bottle - plastic. And for the central post I used an adaptation of Tamara’s method, with cardstock – merely folding 2 rectangles at both ends and gluing them all. Sandpapered the sides a bit. Still crude, but feels good to know that it is do-able. Needs to be adorned and tested; all that for later. For now, it seems to be holding up fine. I've placed a Pony shuttle beside it to compare size. Many thanks to all the designers for sharing their skills ! She's been around for a while. 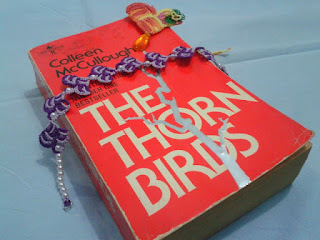 I first noticed her lovely tatted rakhis (bracelets, kind of) on InTatters. Then we followed each other on Pinterest. She makes a rare appearance on Craftree. Our correspondence never really took off, till a couple of weeks back. We are losing many of our bloggers to Facebook. Here's a tatter who comes from Facebook :-) She has shared some beautiful tatting and applications there, and let's hope she will soon share them all on her blog. I love the decorative density of the dot picots - it provides interest, highlight, and texture. They got better, more manageable, as I tatted. TIP : When closing the dot picot ring, I found that the core thread should be pulled straight for smooth closure in one fluid movement, unlike when closing regular rings. 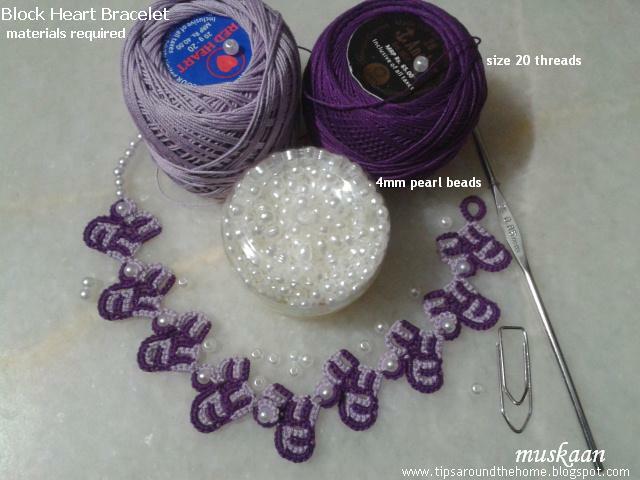 Also, use a smooth, tightly spun tatting thread. Perle cotton may resist closure. Did this post read like an ad or promo ? It kinda is ; but friendly, not materially ;-P Probably a fallback of the notification flashing on my blogger dashboard, informing me that my acvount now qualifies for an AdSense fast-tracking with an amount thrown in (it could buy a dizen balls of Anchor Mercer Every Month ! ) ;-D Ain't gonna happen ! I've been waiting for a lot of things this past week, and the wait continues. The only silver lining is that today I finally took up my shuttles with enough focus & gusto to start tatting my new surprise pattern for spring. I did fill up a few more pages of my sketch book with prospective patterns. This sampler is from Coats and Clark book #121. Georgia asked for a volunteer to diagram the pattern. I went a step further and tatted it as well, along with a notated pattern in modern terms. My sampler curved a bit, looking like a lacy collar. But I probably know the reason why. I'm sure it will lie straight if I tat it again. This was a single-sided scalloped edging from Book 5 by Marie Antoinette Hees. But return back along the same path, and we have ourselves a bookmark. And add a tail with charm, all in one pass. The pattern was shared in the Jan 12 newsletter from Bella Online. But there a few inconsistencies between diagram, notation, and tatted model. I finally chose to work off the tatted model ; the diagram was too confusing. 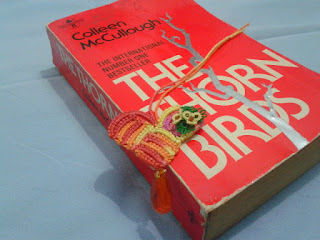 I called this 'Bookmark for a Queen' because of its specially chosen colors, lending a bit of oriental flavour. 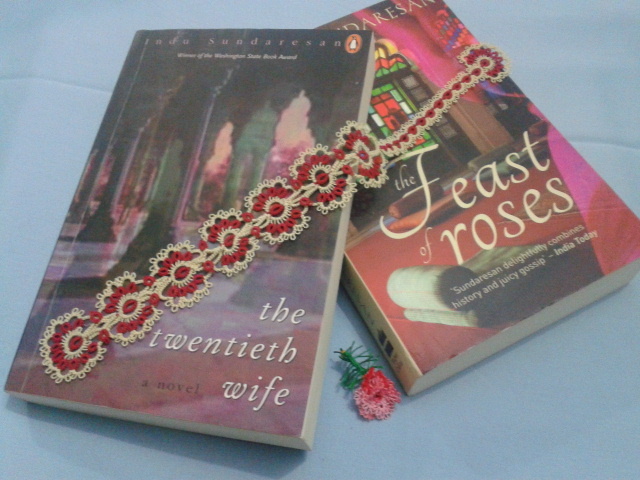 I 'dedicated' it to the protagonist of these 2 books - Mehrunisa who later became Empress Nurjahan. Recommended by my dear friend & mentor Georgia, I had a great read ! And ironically, I liked the 2nd book (sequel) better than the first ! So many memories passed through, having visited many of the places and mausoleums, having studied the Mughal dynasty in our History classes, being acquainted with the architecture and cultural nuances (Mughal culture has confluenced so much down the generations, that some of it was an eye-opener). For a brief few days, I just did not want to take up any other book, so strong was the characterisation by Indu Sundaresan. Peeping out from between the books is the mini 3D carnation. Perhaps it can be a Persian rose ! The bookmark, to me, symbolises her rubies. Once my waiting is over, both patterns will be shared. 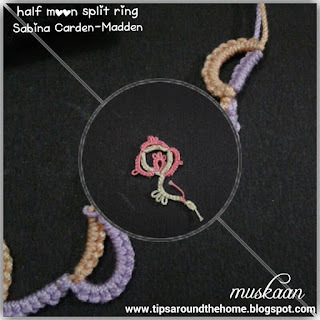 In Tatting Design class, Susan Fuller introduced the half moon split ring as a design element. I had tried it only once before, then forgotten about it. This time was different, having acquired some more experience and understanding of multiple techniques. The half moon split ring (hmsr) , to me, is worked like an upside down split ring (SR) !!! The shuttle 1 flipped stitches and colour show up on the Lower/right side ; in Split ring, they show up on the upper/left half. Stitches in both halves face the same side in hmsr, while they face outwards throughout the split ring. 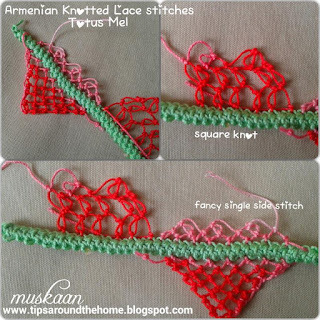 It forms a double arc like a crescent or a half moon, depending on stitch count of the 2 arcs. 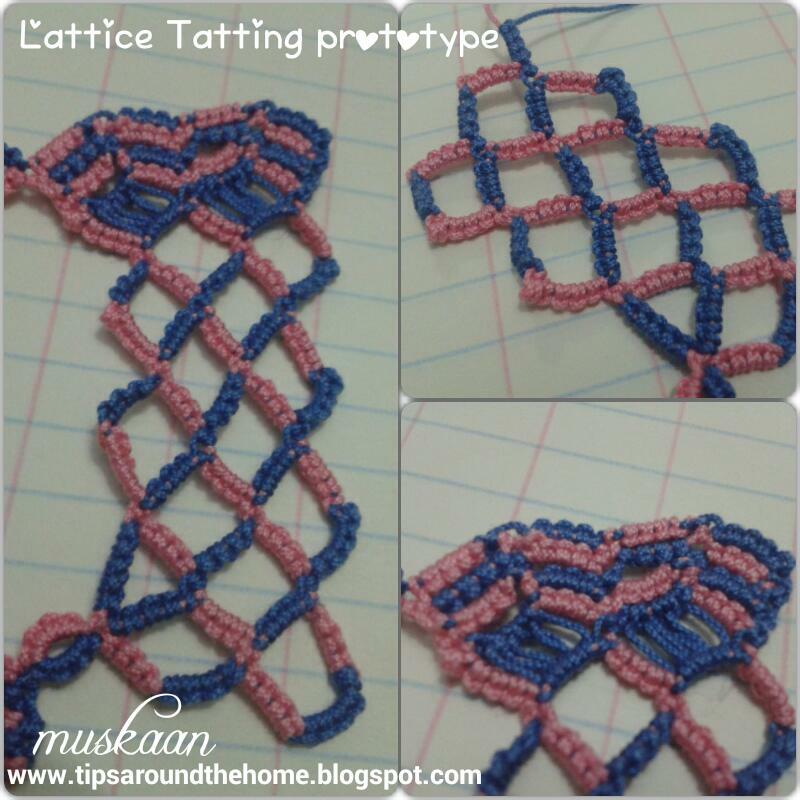 If 2 colours are used, we can tat up a scalloped braid or a wavy row of rings. Add a bead in the notch and you have yourself a neat little bracelet !!! 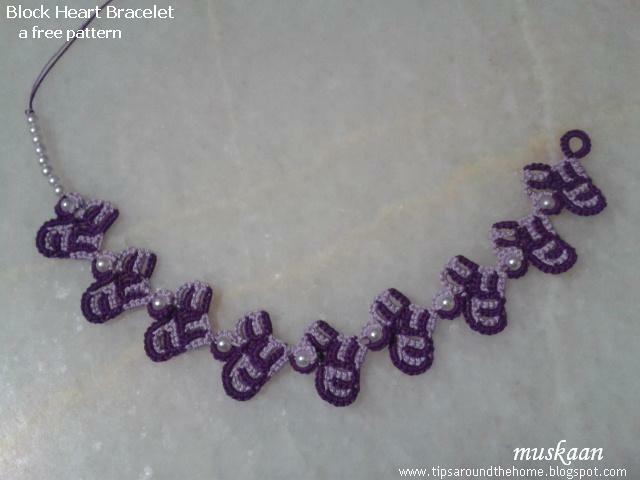 Decorative picots or seed beads on the outer arc create even more interest. In center of 1st pic, 3 hmsr joined back form a kind of triangular inner line (ecru), and scalloped on the outside (pink). And notice the wavy line undulating around an almost straight line in 2nd pic ? While practising the hmsr, it was pretty natural to compare it with Folded Rings . (Curled ring is another way to "fold' a ring, and is compared with Folded Rings here). The pics show practice and experimental pieces, hence not of best quality, nor consistent. Stitch counts, though, were kept largely consistent for comparison. HMSR braid (2nd pic) : shuttles were switched between rings. 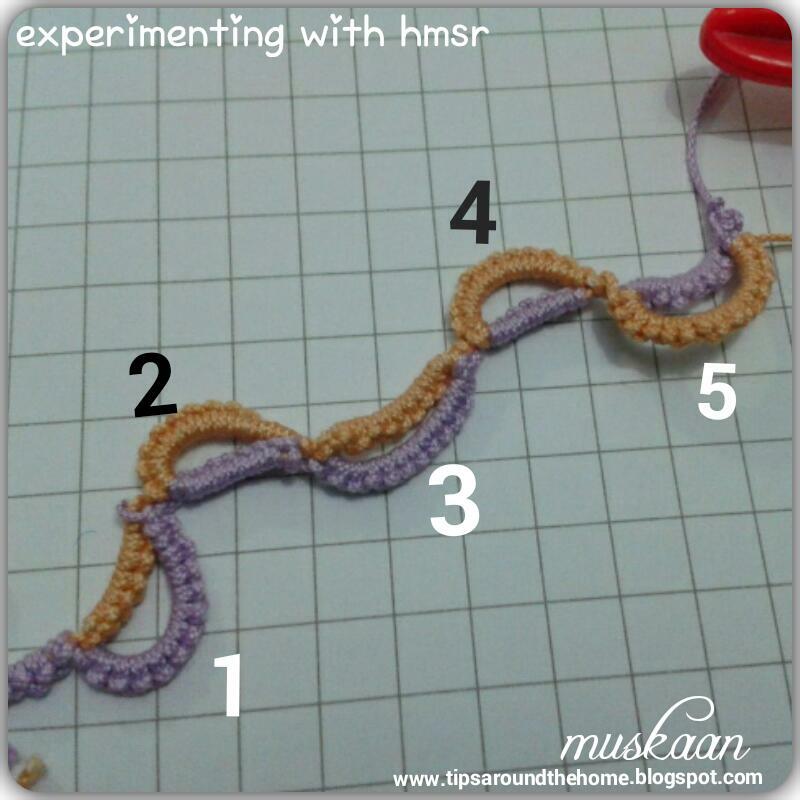 Compare hmsr #1 & 5, both made in same manner, but with more stitches in inner arc. And suddenly the inner arc becomes the outer arc !!! What if the both halves were equal ? Wouldn't it look like a double scallop, but with one colour hidden ? Nice way yo carry a chain effect ! These are only a few. 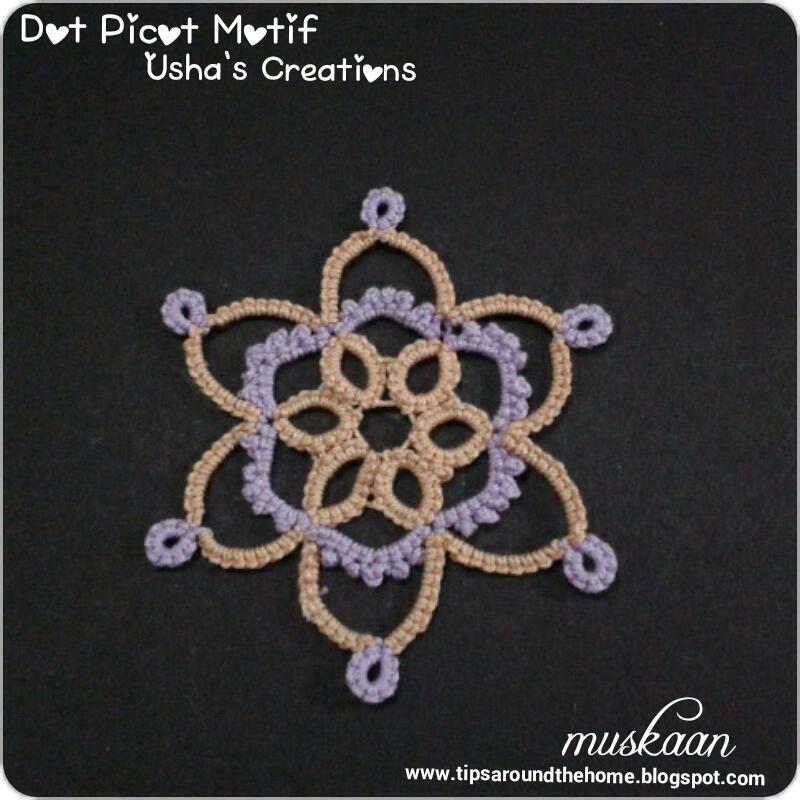 So many more can be found on Martha's tutorial. Oh, and there just might be a surprise introduction to another "project" I have involved in this past week. Spring is in my Heart ! 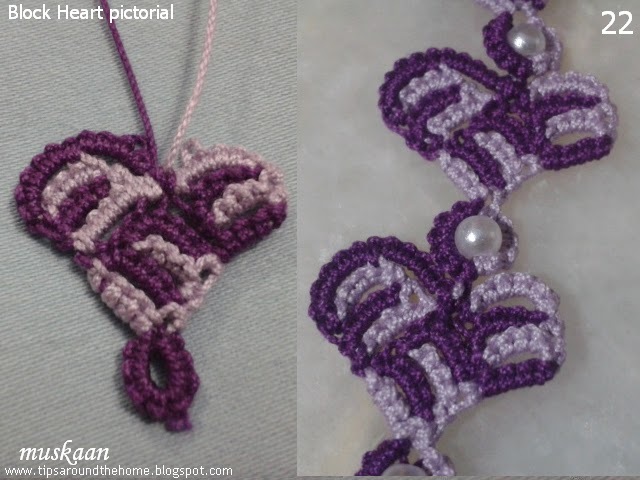 Block Heart Brooch / pendant pattern notated on pic. It measured : 1.25" × 1.75"
I visualized the bright 3-petalled mustard flowers - a harbinger of spring in North India. The fields are literally yellow as one drives across the region !!! SH1 - yellow ; SH2 - green , in size 40 thread. Flowers : R1 : 2-8-2 ; R2 : 2+8-2 ; R3 : 2+8+2. All small picots. Leaves : R : 1 (-1)×10 with large picots. Stem between elements : short Josephine Chain of 4-6 hs. Sandalwood beads sewed in center while sewing on the sprig. A teardrop gem sewn in later. A size 20 heart beside the larger one. This family saga book was a thank-you gift from a friend & colleague three decades back. Loved it then, loved it again ! The main protagonists, Megan & Father Ralph, are effortlessly brought to life, with memorable interactions. Drogheda, itself is a looming, vast , vibrant protagonist almost ! Her descriptions of the sheep station & the Outback bring it all to life, very vivid, very potent. A superb glimpse into farm life & breeding, the hard life, the struggles & loneliness, etc. And when the first droplets of rain fall, I could rejoice as if I were right there. When I Googled to see if it was made into a movie, my jaw literally dropped !!!! Richard Chamberlain as the priest - Wow ! I could Totally visualize Rachel Ward & Richard together. There was a personal surprise, though. High praise & gratitude for the valour Indian soldiers ! But the war narrative was the only part of the otherwise perfect story that seemed a bit a drag. I'm sure feminists pan the story, and some if it may be "politically incorrect" in today's world. Whatever. A story well told, that touches the heartstrings is a winner ! A personal quest for perfection , for the ideal - that's how I see it. So I guess this is my 'punishment' for not keeping the last post short ! I did regret it, soon after it was uploaded - the pictorial could've been converted & uploaded as a separate pdf - an addendum to the main pattern - for those who needed to see the steps. Oh well, too late. Will be posting from my tablet for a while ; unsure of how the pics really look ... at least it won't add to the backlog. Continuing with the next 2 stitches, videos of which have been uploaded by Totus Mel. Love the Fancy Single Side stitch, a row of which I added to the Square Knot rows later. As I see it, so far there are only 2 basic movements/knots to remember - kind of like vectors, because direction determines choice. We use one movement if the next knot is to be worked to the left of present knot ; and a similar but 2nd movement if the next knot is to the right of present knot. Evolved many weeks back. A prototype, still on shuttles, unblocked, unshaped. I wanted to present it as a proper bookmark with a few filled-in hearts for Valentine's. The sketch was ready. But the technique needed a bit of polishing & cleaning up before sharing. Not surprisingly, got busy with a lot of other stuff. Have you seen this before ? If no, then wait a bit more for the reveal. 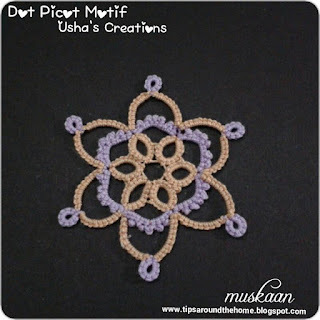 This is not filet tatting, and much simpler to work. ... and soon we have a bracelet ! Who would've thought a little heart in the corner of a collage would make it's way to so many hearts ! A journey that started in 2014 ends here. Georgia has graciously published this pattern in the latest Bellaonline Newsletter and has included it in her Feb 13th Online Tatting Class ! It is difficult to include every little detail in a pattern. Through a pictorial, I can include my reasoning, alternatives, and tips. 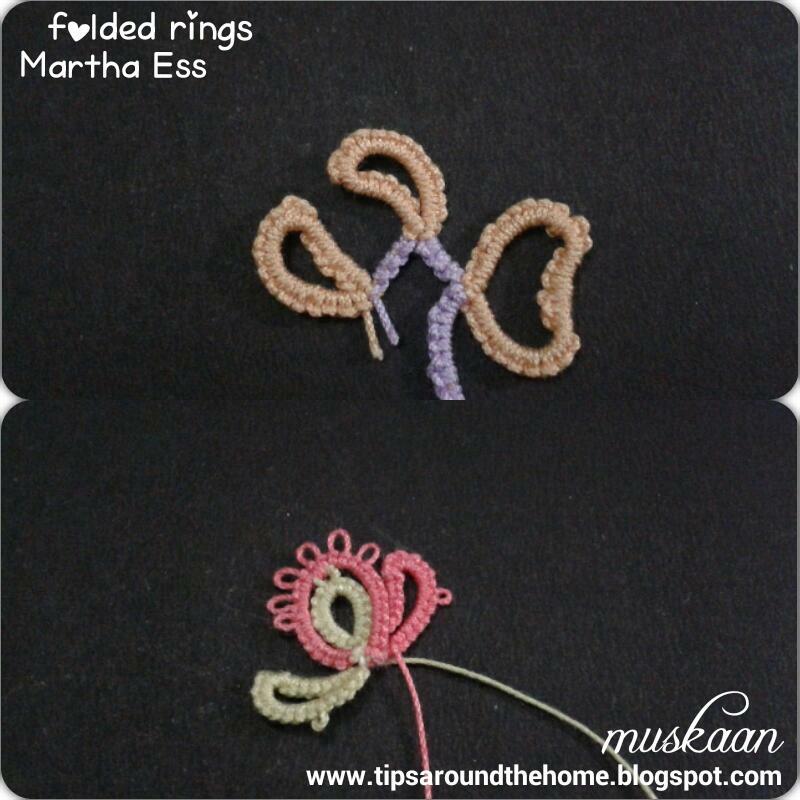 You are free to choose your favorite method of block tatting and hiding ends. 2. tat over shuttle 2 tail, hiding it in the starting ring. 4. start Block I, tatting over shuttle 2 tail. 6. complete row 1 and continue. Don’t pull too tightly on the tail end yet. NOTE : I like to use 2 fhs at the beginning of even (DS) rows, instead of 1DS. NOTE : all DS rows worked from left to right, end in a lock join. 10. row 3 is tatted with reverse stitch. After LJ, make 1 RS, vsp. Now tug at the shuttle1 tail from #3 and snip off the excess. Both tails hidden !!! COMPARE #11 & #15 : the loop that is pulled up through the picot will determine which colour is visible at the end of that row. 18. depending on which colour you want to highlight, choose the loop from that thread. The difference is visible in #22 below : on left both loops were from light colour ; on right pic, the BJ to row 4 was made with darker colour thread, thus giving a dark center. 22. one heart complete. Now to make a split ring with bead in center. 23. start first half of split ring (SR), joining to chain below. 25. complete second half of SR, joining to the bead picot. 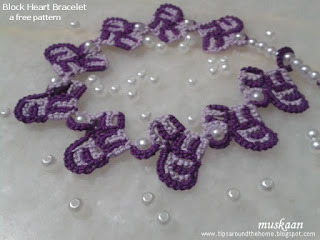 NOTE : the number of stitches on either half of SR will depend on the bead size being used. I still don't have bracelet findings. Hence I strung more pearl beads through both threads and made a simple knot. Keep them a bit loose. Then I joined a metallic split ring and wove the thread tails back into the beads to hide. The bead tail can be inserted through the starting ring and the length of bracelet altered to suit any wrist. Marie tested this for me, wearing it for quite a while and she confirms that it works. The heart motif pattern is generic. As long as block I is a square and the number of rows is even, the heart can be enlarged to any extent, while still keeping shape. The above model is tatted in size 3 or 5 thread. It has 8 stitches per row and 6 rows per block. I am halfway through adorning it. Will share that pic in another post or upload here, too. Sorry for not keeping my promise of short posts ;-D But hopefully a stepwise pictorial will help some of the beginners. Enjoy Valentine's Day ! YA grateful thanks to Georgia, Melanie, Marie, Ninetta, Corina for their invaluable contribution in terms of feedback, suggestions, and test tatting. I was equally touched when my other friends offered to set aside their own work if I needed their help. What’s not to love about Tat Land ?! I didn’t participate last year. But there's always so much to learn from Jane's ingenuity :-) So I started both projects together, tatting and taking day-wise pics, but didn’t keep it up. The carrot & greens are made with some leftover embroidery strands. For the greens , I used my spot adaptation of Corina’s fringe. 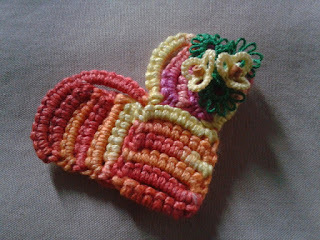 Instead of the core thread, though, I joined them to the picot thread, while forming the picot, and snugged the picot tight. I found this quicker, easier, leaving no floppiness either. This is one of a set of 3 coffee table books including ‘The Oceans’ and ‘Space’ by Fergusson Publishing, Chicago. At the start of each chapter, the wildlife of each region is depicted on the map graphically, giving a bird’s eye view of the range & distribution of fauna. And of course, there are lovely photographs and history. Have I read the entire book ? Ummm, no! But I like to flip pages and settle randomly on something. The final came all you soon, but journey was joyful, with so much enthusiasm from all participants. She measures a petite 2½"× 2¼" in size 20 Lizbeth Vineyard Harvest. 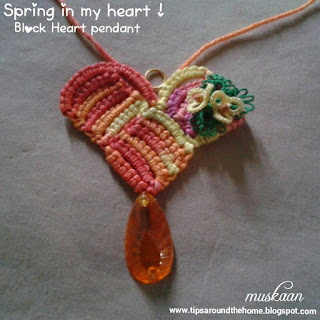 on TIASes, tatting on paperclips, and block heart ! Georgia has a great new surprise project every month on the Online Tatting Class. Phyllis’ tatting on a paper clip – a new pattern every month through this year ! The first one for January is this cute fish. Hmmm, I just noticed. See, instead of printing the pattern, I had quickly sketched the diagram and jotted a few things. Only now, as I compare her tatted model with mine on the large screen, do I notice the difference in tails (compare the caps). Please note : To be sure, RODS is reverse order of a normal Flipped double stitch, not the unflipped second side of split ring, which is called a Reverse Stitch & it subsumes a reverse order but of unflipped half stitches. I'm still going with a lady in a gown and this is her hair/hat/hood ; the rest of her ensemble shawl or cape will appear next, crossing over the neck with an alligator 'pin' (join) and tying off at that tiny little picot on the right ! I have so much lined up to share, but don't want to make this too lengthy ... so we'll all just have to wait a while longer ;-P But here's a peek into a single Block Heart - a larger one that can be used as brooch, pendant or lapel pin, or perhaps something else. 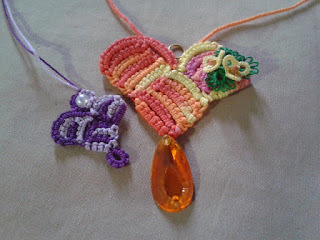 This was the project with size 3 or 5 thread with which I made the fish above. It's still a work in progress, though, and I used a different join. 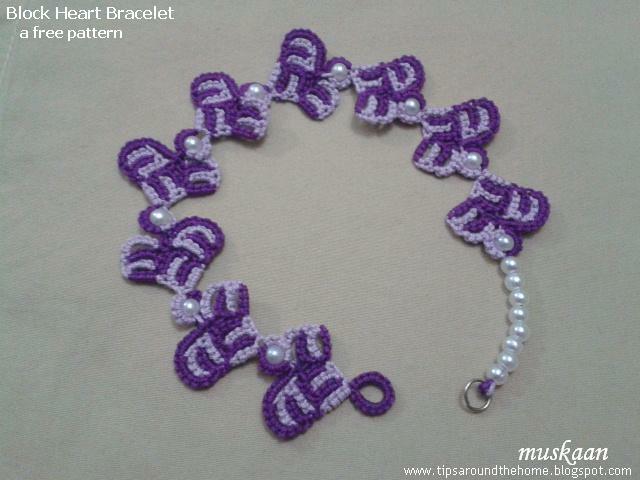 Many thanks to Jane and Phyllis for sharing their delightful patterns and I look forward to tatting more of them ! I would first like to thank everybody for their immense support and prompt help with testing the block heart pattern. I am very touched, to say the least. More when I post the pattern – and it will be within this week ! This pattern always reminded me of our schoolbook atoms and molecules or of orbiting planets. The long chains made perfect elliptical orbits. And this book I’m currently reading ('Genius' by James Gleick) only reinforced that visualization. Also, I wanted to see how a flake in black would work out – yup crazy me. Can’t say whether this is matter, antimatter or the universe. The beads (are they electrons or planets?) are very glittery in real – difficult to capture here. Sequins were a first, too. I passed shuttle 1, back to front, through the space created in round 1 chains and then continued with the Josephine chain. A simple over-under ‘join’. My first attempt at sequins, though the principle of tatting with beads, buttons, etc. is essentially the same or similar. I wanted the sequin to be flat inside the ring, rather than outside. So, start ring and when we come to the picot, first pull the picot loop through the sequin hole, pass the shuttle through this loop (as we would normally) and snug neatly but not too tightly. This keeps sequin flat and in place. Continue with the rest of the ring and close. I would’ve liked to work in 2 colours to better reveal the interweaving chains, but that might’ve become a very busy kind of rendition. 30 beads strung randomly on shuttle #2 in round 2, and brought forward on picots. Do you see what I see ? Doesn’t it look like a fierce cheetah – eyes glaring out ?! Or perhaps it is Lord Shiva’s Cosmic/third Eye ? Techniques : thrown rings and clovers, spiral or Josephine chains, beads & sequins on picots, over-under join. ‘Genius’ by James Gleick is a biography of Richard Feynman the exuberant ‘mad genius’ written in an engaging style! It is a very absorbing read. Even though I superficially ‘understand’ much of his work and the physics described, it is a commentary on the evolution and establishment of Physics & of course quantum mechanics. As I read, I am frequently reminded that all that we take for granted now, or what we thought was done ages ago, is not even a century old, even Medicine as a a science !!! My husband had a couple of books by Feynman before our marriage and he has become one of my favorite scientist-writer – always so full of spirit, full of ideas, practical solutions, and such a great communicator. Down the years, we’ve bought many more of his books, but I’ll share more in future.